Who is the Coffee Shop Rabbi? What Does "Shabbat Shalom" Mean? Do modern Jews believe that God has an actual account book in which our lives are measured? In a word, no. This tradition has its roots in Biblical metaphor. In Isaiah 4:3, the prophet speaks of the survivors of the Babylonian invasion as those who are “recorded for life in Jerusalem.” It is referenced more clearly in a book of midrash called the Book of Jubilees that was not accepted for inclusion in most Bibles. The idea of a divine accounting book has its origins in Babylonia, where the concept of a Day of Judgment also first appeared. 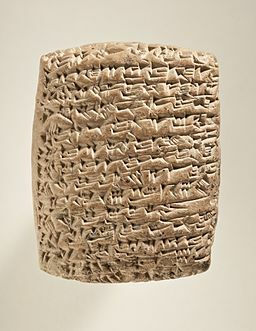 The civilizations of Mesopotamia were enthusiastic about bookkeeping. Much of the written materials we have from them are accounting books; it’s not surprising that they thought the gods would love accounting, too. God may not keep an actual accounting book, but our lives are finite. None of us knows when we are going to die, only that we will not live forever. On Yom Kippur, we take a day to think seriously about our lives. What have we neglected? What have we done that we would regret? On Yom Kippur, there is still time to make it right. But the image of the Book of Life pushes us to get moving. Do not delay another hour! Because we don’t know how long we’ve got, how many more pages there are in our book. While Jewish tradition is very vague about afterlife, it is sharply clear about this life, and unromantic about death. Death is an end to this life. On that day, whenever it comes, we’ve used our last opportunity to do good or to reconcile. Yom Kippur is a day and the month of Elul is a season, when we remind ourselves of that. What would you regret if you knew you were going to die tomorrow? What would you change? What can you do about it while you are still alive? Posted on September 11, 2014 December 29, 2014 Categories High Holy Days, Yom KippurTags atonement, Bachya ibn Pekuda, Book of Life, repentance, Sefer HaChaim, Teshuvah, Yom Kippur4 Comments on What is the Book of Life?